Numenera – What is it? TM and © 2014 Monte Cook Games, LLC. 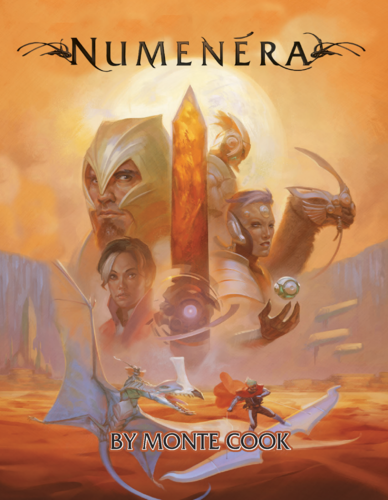 In the recent days I have decided I was going to form a new voice of IP (VoIP) gaming group and the game of choice will be Numenera by Monte Cook. This decision prompted me to pull the rule book off my shelf and blow the thin layer of dust off the book (a terrible thing to have happen, dust that is). Upon reading the the introductory chapter, Dreaming of the Future, my imagination was sparked. And so begins the tale of the Numenera. This time I will be behind the screen and not a player. I would be remiss if I did not begin this off with a review of the physical product itself. I introduce to you, Numenera RPG! This 416 page book is jammed packed with a great deal of information. Monte Cook sets the stage by presenting a short story (just a few pages) at the beginning of the book to set the tone for what remains in the book. The presentation of the book breaks from tradition (as does much of numenera) by starting out with a summary of the rules a player needs to know and internalize. I then continues on to character creation. Following that is a more robust section on game rules and optional rules. The next section The Setting (Part 4) is the single largest section in the book. It is packed with so much detail that the presence of the region, locale or NPC jump right off the page and into your mind. The remaining sections of the book cover topics such as artifacts, a small monster section, running the game and much more. There’s even a 4-pack of beginning adventures to get gamemasters going right away. Physically, the book itself is well constructed. The print is easy to read and the Monte’s use of side bars and his ability to cross-reference his work is as always superb. Even the end papers are printed with a map of the known world of Numenera. In the rear of the book, comes a “tacked” in foldout map of the world. Having used the book in the past as a player and now rereading it, I would speculate that the high quality of the printing and binding will most definitely stand the test of time and table use. Here’s a brief summation of what Numenera is and is not. Let’s be clear Numenera is NOT a sci-fi game. It is a game that is focused on Sci-fantasy. To fully understand that “newish” term you must understand that which is Numenera. What is Numenera? No, not the game itself, but Numenera itself. In the Ninth World, Numenera is that invisible essence that powers devices and gives Nanos their powers. In terms of other, more fantastical RPGs, Numenera is the magical weave or esoteric energy that magic is derived from. Numenera is everywhere and everywhere it shall be. So, as you can see it is more fantasy base science than science fiction. The game mechanics are just as innovative as the theme of the game. The two blend very well together. 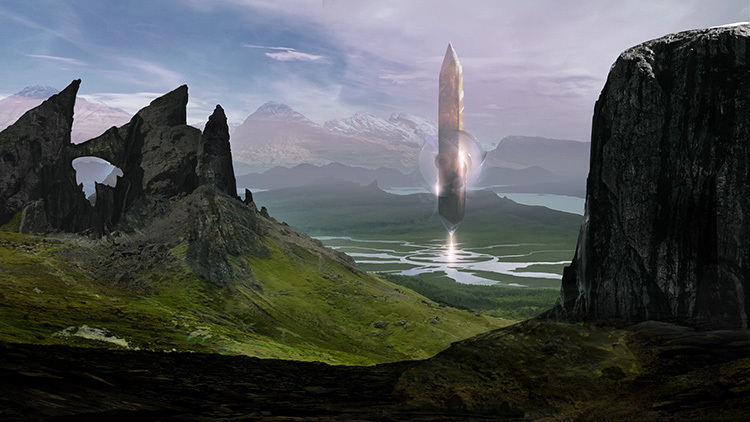 Numenera breaks from tradition and charts its own course in the world of roleplaying games. Though it is primarily a d20 system, the mechanics are very different from the other d20 based systems already on the market. For example, the gamemaster (GM) does not roll any dice. In any situation that calls for a GM to normally roll, a player would roll versus a target number. Combat works like thus: If the player is making an attack roll, the GM sets a target number based on the toughness of the opponent (very traditional, ‘eh?) and if the player meets or exceeds the target number he hits. If the player is defending from an attack he would make a defense roll, the GM again sets the target number. If the player meets or exceeds the target number he successfully defends against the attack, if not the character is thus hit by the attack. I know that was a long-ish example, but I think it will help you to fully realize that Numenera is not your typical RPG game. The mechanics of the Numenera are minimal, but do not let that fool you. The rules themselves are robust and work very well (player’s perspective), but are wrapped and presented in a minimal package that I am sure you’re going to like. Next Post Appendix N Kickstarter Still Missing!